Dramafever Set To Premiere First Original Co-production "The Heirs"
Today, DramaFever announced a first-of-its-kind co-production deal with Korean production shingle, Hwa & Dam Pictures. 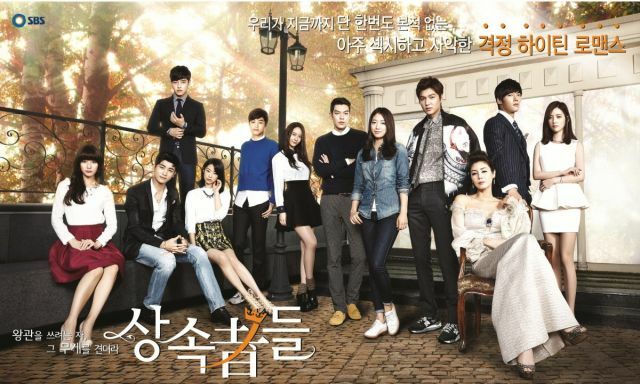 Premiering this week in the U.S., Canada, and Latin America exclusively on DramaFever, "The Heirs" is a 20 episode romantic drama series starring Lee Min-ho ("Faith", "Boys over Flowers") and Park Shin-hye ("Flower Boy Next Door", "Heartstrings") which follows a group of privileged, elite high school students as they are groomed to take over their families' business empires while grappling with the trials of finding true love. The first episode of "The Heirs" will premiere internationally on Korean television network SBS on October 9th. Each week following, both SBS and DramaFever will air two consecutive episodes for a total of 10 weeks. 'Heirs' is written by Kim Eun Sook, who also penned the international hit dramas 'A Gentleman's Dignity' and "Secret Garden". This co-production marks the first time that a Korean production company and a digital American distribution platform have teamed on a multi-language title. DramaFever maintains exclusive online distribution rights for North and South America, as well for online redistribution to third-party platforms like Hulu and Netflix. "In the coming months, and certainly into 2014, we'll be developing and co-producing more original made-for-web and broadcast-level programming. We're thrilled to be partnering with such a prominent international production team like Hwa & Dam Pictures' on our first move into original content", said Suk Park, DramaFever Co-Founder and Co-CEO. This announcement comes on the heels of DramaFever's recent deals with Telemundo and Fuji TV, which both represent the top networks in their respective markets, and will expand DramaFever's library of fully-licensed premium programming from around the world to include each network's most successful titles, translated into English and Spanish. Added stills for the upcoming Korean drama "Drama Special - Your Noir"
Added new stills for the Korean movie "Tough as Iron"